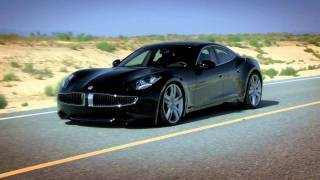 The Fisker Karma 2012, a 400-horsepower luxury sedan that can accelerate from 0-60 mph (97 km/h) in 6.1 seconds, is one of the most efficient, lowest emission automobiles available despite its size, performance and visual appeal. 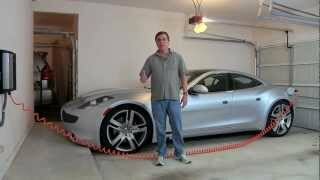 Anaheim, California USA – November 16, 2011: The Fisker Karma Electric Vehicle with extended range achieves 112 mpg (2.1 l/100km) combined fuel economy and emits just 51 g/km CO2, according to independent testing by the Technischer Üeberwachungs Verein (TÜV), Europe’s recognized automotive certification agency. TÜV tests also validated the Karma’s all-electric range at 51.6 miles (83 km). Separately, the US Environmental Protection Agency (EPA) has rated the Karma a 10 out of 10 for fuel economy and greenhouse gas emissions, while the California Air Resources Board (CARB) recently offered its certification, making the Karma emissions compliant in all 50 states. The Karma, a 400-horsepower luxury sedan that can accelerate from 0-60 mph (97 km/h) in 6.1 seconds, is one of the most efficient, lowest emission automobiles available despite its size, performance and visual appeal. These figures are possible due to the Karma’s cutting-edge EVer™ (Electric Vehicle extended range) powertrain technology, which combines the zero-emissions and efficiency of electric drive with the range and freedom of petrol-powered cars. Technically a series plug-in hybrid, the Karma gives drivers the ability to run emission free on demand, as well as travel long distances without the range anxiety or long recharge times associated with pure electric vehicles. While the Karma can run on all-electric power in Stealth mode for 51.6 miles, it has a total range of up to 300 miles (483 km) before a stop for gas or recharge is required. When driven in charge-sustaining Sport mode the Karma achieves 26 mpg (9.2 l/100km) combined fuel economy in TÜV tests, the best of any full size, US-market luxury car.